This article explains how to configure Policy-Based Routing (PBR) on Gaia OS to route traffic according to user-defined policies. Interface at which a packet arrives. 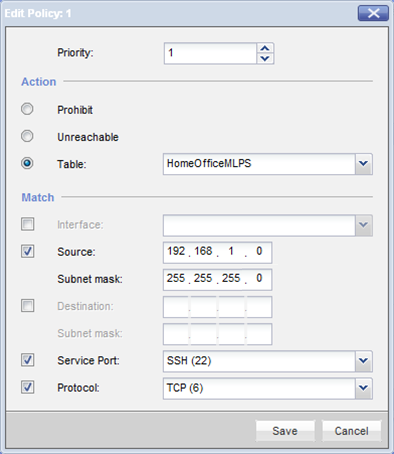 Source IPv4 address and subnet mask. Destination IPv4 address and subnet mask. Prohibit: Send a "Prohibit" message to the sending host. Unreachable: Send an "Unreachable" message to the sending host. Table: Process the traffic according to rules defined in an "Action Table"
You can define many Policy Rules. Traffic is compared with all the rules in order of the rules' priority - one rule at a time, according to the priority that is configured for the rule. Policy-Based Routing (PBR) can be used to direct traffic based on where it is coming from (this may include single hosts to entire networks) to where it is going (also single hosts or entire networks). This greatly improves the control that network administrators have in regards to the routing of traffic through a network. 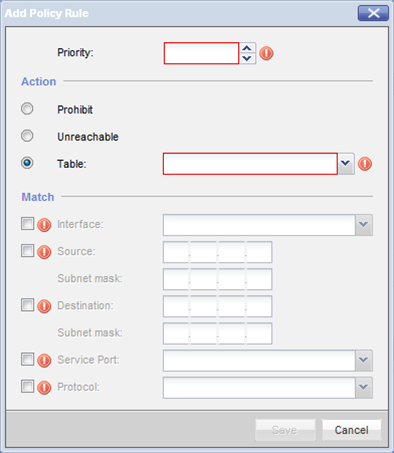 For example, a company may want all traffic from a specific source to use a different route instead of using the default gateway; this can be defined in the action tables for Policy-Based Routing (PBR). 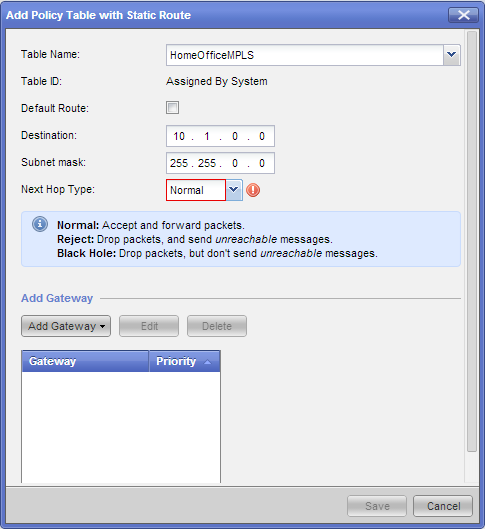 If the packet matches, it is then forwarded according to the priority of the Policy-Based Routing (PBR) static route. If the packet does not match a Policy-Based Routing (PBR) static route, the packet is then forwarded according to the priority of the static routes in the OS routing table. It is important to note that routing tables, including PBR tables, are checked after firewall processing is complete. This means that in situations such as NAT, routing rules are checked against the original source address (refer to sk101562). Hardware All Check Point appliances and Open Servers that are supported by the above Gaia OS versions. PBR must be configured on each of the cluster members individually, and the configuration must be identical. 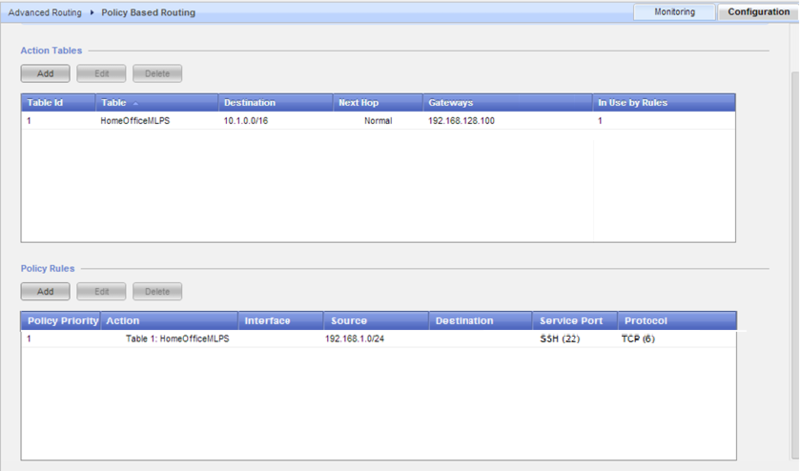 PBR can be configured only on Virtual Routers in the SmartDashboard. When VSX mode is enabled, Gaia Portal is disabled on Security Gateway as it is not supported in VSX mode, and the Clish command "set pbr" command is disabled for Virtual Systems. Furthermore, configuration in the SmartDashboard supports only Source Address and Mask, and Destination Address and Mask. Virtual Router is not compatible with VSLS. In VSX mode, PBR supports Source IP, Destination IP and Interface, but not the additional parameters (service port and protocol) that were added starting in R77.30. Note: In VSX mode, Policy Based Routing (PBR) can be configured only in the SmartDashboard and only on Virtual Routers (via the Advanced Routing configuration). 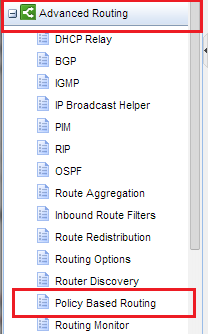 In Gateway mode, Policy Based Routing (PBR) can be configured in Gaia Portal, or in Clish. Table Name The name of the Policy Table. Table ID A numerical ID for the Policy Table. Assigned by the system. 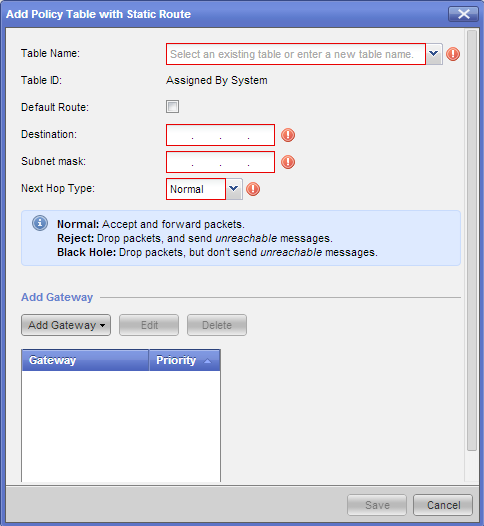 Default Route The default static route in the system routing table. Destination The destination of the route. Subnet mask Subnet mask for the destination of the route. Normal: Accept and forward packets. Reject: Drop packets and send unreachable messages. Black Hole: Drop packets but don't send unreachable messages. Gateway IP address Next hop gateway IPv4 address. Gateway Interface Security Gateway interface that leads to the next hop gateway. Gateway Priority The preference of the particular route. Range: 1-8. Note: The 'Next Hop Type' field is flagged as an error because setting this field to 'Normal' requires at least one entry in the gateway table. We will add the Gateway in the next step. In the 'Add Gateway' section, click on 'Add Gateway' button. Note: You can select either 'IP Address' or 'Network Interfaces'. For the purposes of this example, we will choose 'IP Address'. Priority Many Policy Rules can be defined. Traffic is compared to each rule, in order of their priorities, until a match is found or all Policy Rules have been checked. Prohibit - Send a Prohibit message to the sending host. Unreachable - Send an Unreachable message to the sending host. Table - Perform the actions defined in an Action Table. This section specifies the criteria traffic must match in order for the Policy Rule to apply. One or more of the following may be used; in this case, traffic must match each criteria in order for the system to apply the Policy Rule. Interface - The interface on which the traffic was received from the host by the Security Gateway. Source, Subnet mask - The IPv4 address and subnet mask of the source. Destination, Subnet mask - The IPv4 address and subnet mask of the destination. Service port  Enter the service port. Some pre-defined ports are: FTP data (20), Telnet (23), HTTP(80), POP2(109). Protocol  Enter the protocol number. Some pre-defined protocols are: ICMP(1), TCP(6), UDP(17). 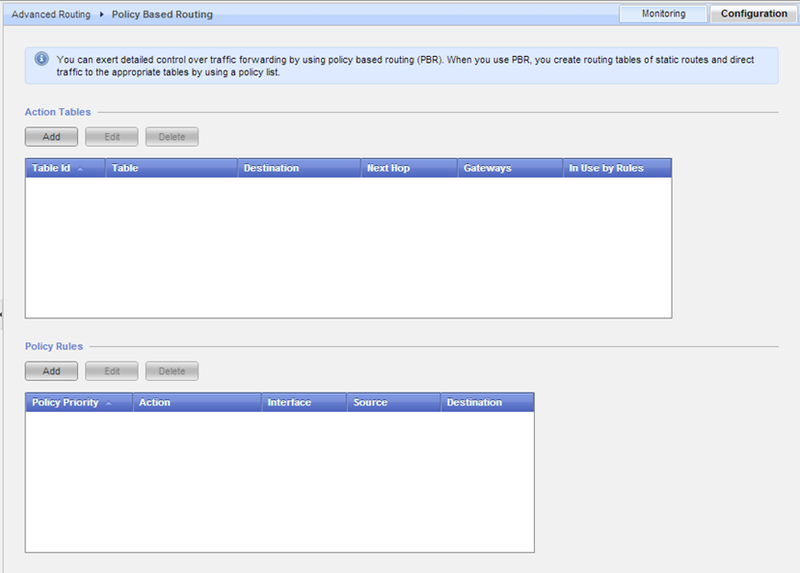 To verify that routing is working as expected, refer to "(5) Verifying Policy-Based Routing (PBR) configuration" section. Connect to command line on Gaia OS (over SSH, or console). 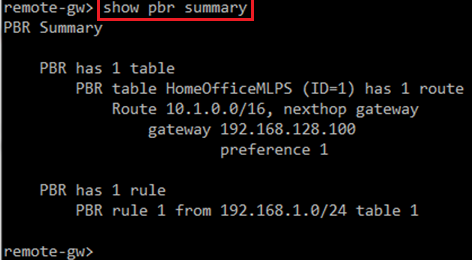 To verify routing is working as expected, refer to "(5) Verifying Policy-Based Routing (PBR) configuration" section. Each line is a routing rule, with the priority, matching criteria, and action to take. The results show us there are four rules for routing traffic. The second line, with a priority of 1, matches the policy we defined (if we had configured the policy with a priority of 3, it still would have been second in the list, but with a priority of 3). The action for this rule, "lookup 1", says traffic matching the specified criteria will be handled according to Action Table with ID 1. The results show that traffic destined for 10.1.0.0/16 will be routed via 10.10.10.1 out the interface eth1. Another method of verifying that Policy Based Routing is working correctly is to capture the traffic using the 'tcpdump' command. Since both traffic going to the Internet and traffic going to the Home Office exit via the same interface, we need to use the MAC address of each router to identify them in the tcpdump output. Note: In this example, there has been recent traffic to both the Internet and to the Home Office. To determine this, run the 'tcpdump' command (in Expert mode) on the relevant interface (eth1) with the "-e" flag. 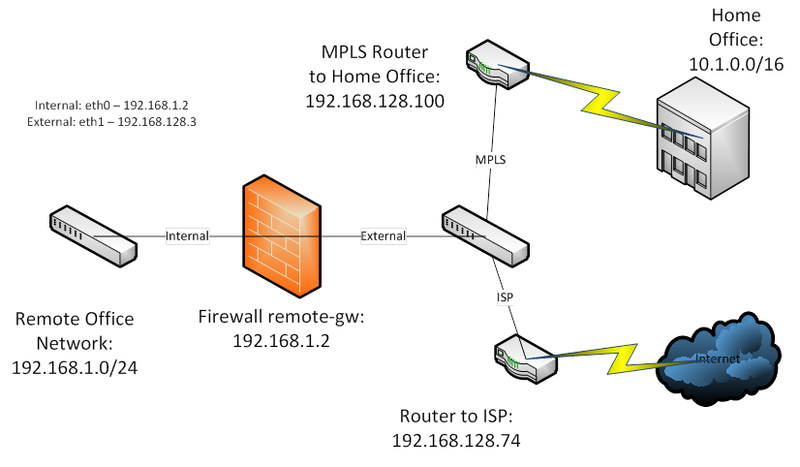 Note: In this example, a host in the Remote Office network is pinging a host in the Home Office. The first packet in the output is the ICMP Echo Request from the host in the remote network (192.168.1.5), to the host in the Home Office network (10.1.0.1). The Destination MAC address is 00:0c:29:f3:06:76. As shown in the output from 'show arp dynamic all' command, this is the MAC address of the MPLS router, which is expected, if the PBR rules are working correctly. The second packet is the ICMP Echo Response, which has a Source MAC address of 00:0C:29:F3:06:76, indicating it came from the MPLS router, as expected.